SLOW SMASH The two lobes of Ultima Thule probably came together at the speed of a person walking briskly into a wall, researchers announced. THE WOODLANDS, Texas — Ultima Thule’s history may be written in the sum of its parts. New analyses suggest that the tiny space rock formed from rotating clouds of even smaller rocks that collapsed into two individual objects. Those objects then gently collided in the early days of the solar system, creating the distant double-lobed world studied by the passing New Horizons spacecraft, researchers reported March 18 at the Lunar and Planetary Science Conference. NASA’s New Horizons flew by Ultima Thule, officially known as MU69, on January 1 (SN Online: 12/30/18). The first images that the spacecraft sent back suggested a snowman-shaped world, with a larger lobe that the team dubbed “Ultima” and a slightly smaller bulb called “Thule” (SN: 2/2/19, p. 7). But subsequent images showed that the lobes look more like flat pancakes or hamburgers than jolly snowballs (SN: 3/16/19, p. 15). The first map of the space rock’s geology may help explain that flatness. The map shows distinct mounds on both lobes whose borders are still visible today, planetary scientist Jeff Moore said at the meeting. Moore, of NASA’s Ames Research Center in Moffett Field, Calif., and his colleagues think that those mounds represent small or medium-sized rocks that organized themselves into a rotating disk before merging into a lobe. That rotation could have spread out material in the lobe, flattening it. “The disk was spinning … and that’s why we have the hamburger shape,” Moore said. 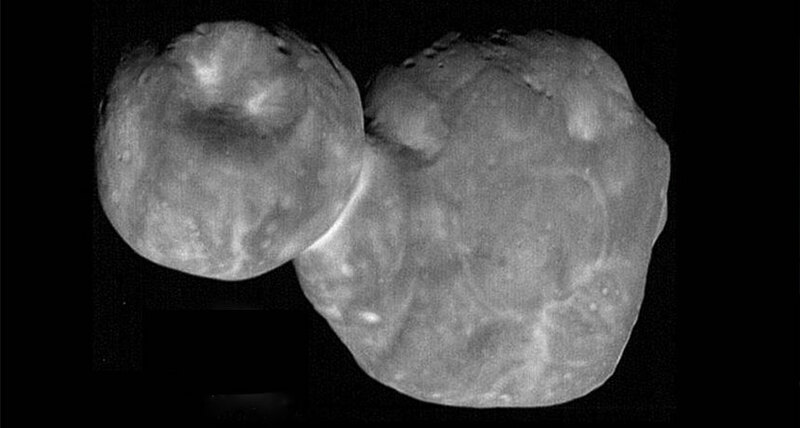 Planetary scientist William McKinnon of Washington University in St. Louis agrees, although he adds that “this has not been proven.” McKinnon also presented computer simulations of the final collision between Ultima and Thule that showed that the two must have been moving at about 2 meters per second when they collided. That’s about as fast as a person walking into a wall at a brisk pace, McKinnon said.